I hate synopses. I’m pretty sure I’ve blogged about that before. I hate writing them. I’m not very fond of reading them, either. And I shouldn’t have to do them for books I publish myself, right? Synopses are just something agents force us to do, right? was to include a synopsis of what had happened in the first book, The Shaman’s Curse. Just in case anyone picked up the second book first, or, you know, didn’t remember what had happened in the first book. It turned out not to be as brief a synopsis as I’d hoped. I just finished adding the synopsis for The Voice of Prophecy. About 18 pages combined. If I keep this up, by the fourth (and final) book, I’m going to have a very long synopsis. Which means I need to do some more work, revising this monster down to a more manageable size. Trying to make it more interesting wouldn’t hurt, either. I think I’ll have to get some of my critique partners involved in that. Also, because of Amazon’s Look Inside feature, I may have to consider moving the synopsis to the back of the book. Which doesn’t make very good intuitive sense, but that may be the way it has to be. Especially since I’m also considering adding other ancillary material. 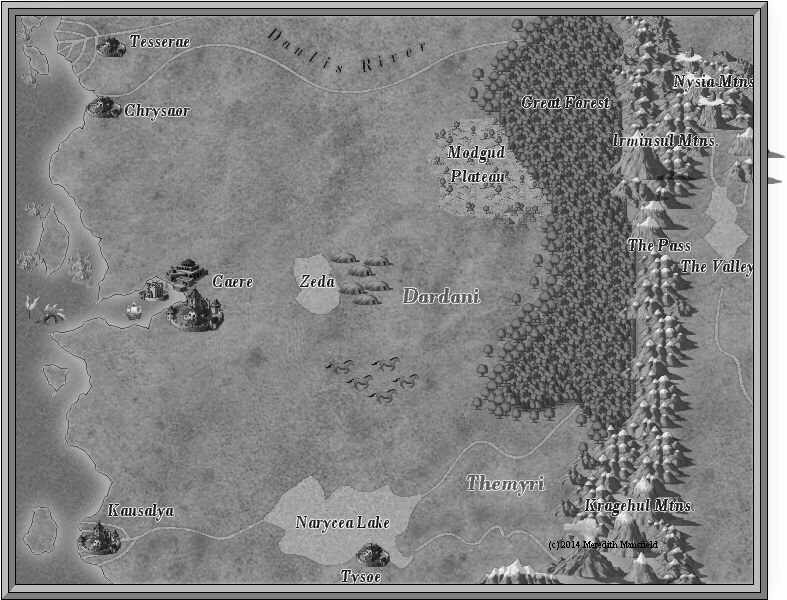 I still haven’t got the map quite the way I want it, but maybe in time for Beyond the Prophecy. Through the second book, nearly everything took place in Caere, at Zeda, or in the Valley. Or, of course, somewhere in between those points. So it was possible to follow pretty easily without a map. In the third book, more parts of this world start to come into play, especially Kausalya and Tysoe. 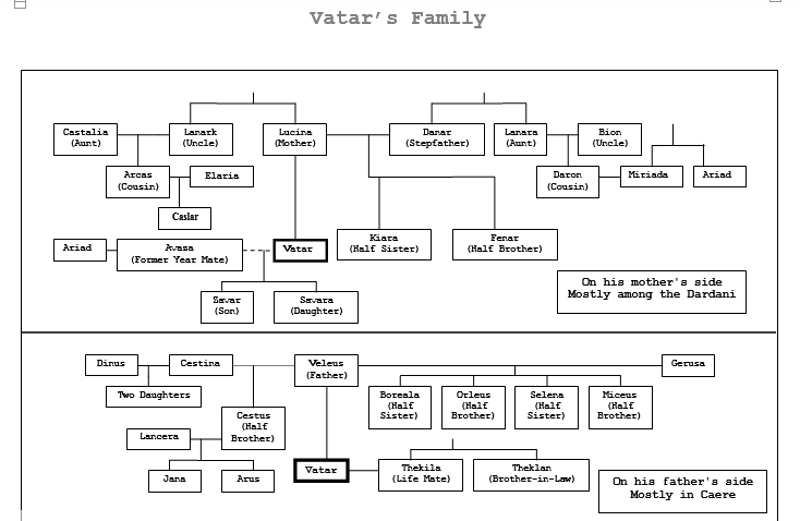 And then there’s this quick reference to how the characters are related to each other. Hmm. Maybe I’ll break that last one into two charts. I don’t see a synopsis in many books these days. I don’t feel they are needed since a reader can simply skim over the previous book(s) if they need a reminder. I do see authors tend to add snippets of past events in the first several chapters of the next books in a series to remind readers of what went on and how those events make the character feel in their current situation. That’s probably a better way to jog the memory than winding up with half a book worth of synopsis by the time you get to the last book. And yah, the whole preview thing gets sabotaged when there is too much ‘filler’ blocking the story. Though if I liked the first book, I buy the second one sight unseen. My advice is if you don’t enjoy writing the synopsis then drop it, I don’t think they are necessary these days and I’d rather see my favorite authors engaged in writing fun new stuff. Just my preference, but I tend to write what I’d rather read. Anyway, I wrote the synopsis during a period when I wasn’t in a good mental space to be writing the next scene, so it actually kept me moving forward–in a weird way.